The Guyana Amazon Warriors were up against the Trinbago Knight Riders for the finals of CPL 2018. While the former made a direct entry into the final by defeating the same opponent in ‘Qualifier 1‘, the latter took a long way around to make it there. With these two teams were highly competitive throughout the tournament, there were quite a lot of expectations on them. The Brian Lara Stadium in Trinidad was jam-packed with supporters from both the sides. The entire ground was covered in red and yellow which was an absolute spectacle to watch. The Knight Riders completely outplayed the Warriors in the final. Their bowlers were very clinical and restricted the opposition to a low score. Then, the Blackcaps duo of Brendon McCullum and Colin Munro did the job with the bat in what was a rather easy chase. With this victory, TKR lifted the trophy for the third time. They triumphed previously in 2015 and 2017. DJ Bravo finally won the toss in the final after missing out in the previous two playoff games. He had no hesitations that his side would bowl first. Right from the first ball of the big final, Ali Khan sent Cameron Delport’s off-stump for a walk dismissing him for a golden duck. Soon, the main man Shimron Hetmyer was also outfoxed by a brilliantly disguised googly from Fawad Ahmed. The 21-year-old walked back to the pavilion after scoring 15 runs. At this point in time, Luke Ronchi and Jason Mohammed took the onus upon themselves to get the innings back on track so that the finishers could do the job later on. The wicketkeeper produced a well-made 44 off 35 balls while his partner played the anchor with 24 off 23 balls. However, once this duo was dismissed, there wasn’t any noteworthy show put up from the other batsmen. They kept falling one after another as the Warriors put up a mere 147 runs on the board after losing 9 wickets. Khary Pierre picked three scalps in the innings. These kinds of chases on the big night of a final can often end up being tricky. Hence, the Knights sent their most experienced batsman in Denesh Ramdin to open alongside Brendon McCullum. The duo added 52 runs for the first wicket with the former Kiwi skipper playing the aggressor. He smashed 39 off 24 balls before being dismissed by Chris Green. There was a rain interruption after 8.5 overs when the Knights’ score was 65/1, 9 runs ahead of the DLS par score. However, overs were not lost despite the interruption. After the break, Denesh Ramdin got out in the most unfortunate way possible. He was out hit wicket after he scored 24 off 30 balls. Soon, Darren Bravo walked back to the pavilion in pain after pulling up his left hamstring. Colin Munro, who was at the other end kept his cool. 31 runs were required in the last 4 overs when the left-hander decided to take the attack to Rayad Emrit. He scored 25 runs off the over and finished the game by hitting at four in the next over. Munro, yet against delivered in the final with an unbeaten 68 as the Knights won the match comfortably by 8 wickets. He was 66 not-out in the final last year. 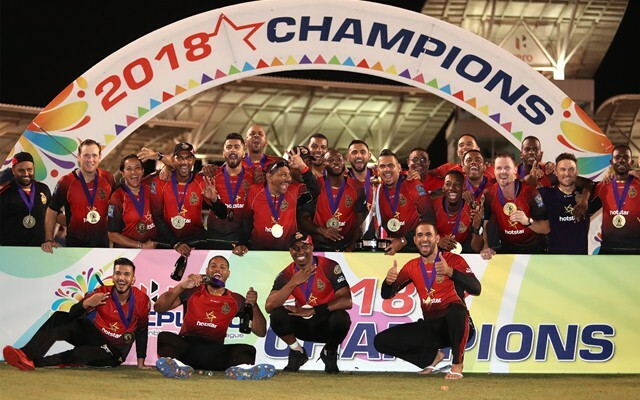 With Trinbago Knight Riders winning their second title in a row, Twitterati was overjoyed. Owner Shah Rukh Khan shared a selfie with the television with the victorious team in the background and was quite elated. Well Played @TKRiders.. Winning the CPL Title for the 3rd Consecutive Time… Speaks Volume of how class this side is.. Yes the defending team saved the streak again and didn't fumble a bit. Talk about winning in style!!!! GAW – 101/6. 14 overs.